This piece of art was created as a visual testimony of the Savior's love for each of us, with the hope that it would bring comfort, peace, and encouragement to all who need it. 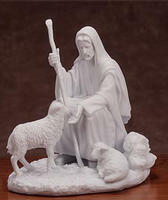 Through the trials, storms, and rocky paths of life, our Shepherd knows the way and leads us to safe pasture. When one of us is lost, He searches until we are found and wrapped safely in His arms. Size: 19"
Ken and his wife Kjersti have been inseparable since they moment they locked eyes in a drawing class in college. They are both classically trained artists who studied art at home and abroad. They enjoy working in a variety of media from sculpture and painting to illustration and digital visual effects. Ken takes great influence from his Grandfather Robert Stum who was influential in founding BYU Motion Picture Studios as a cinematographer on many early church films including Man's Search for Happiness and Johnny Lingo. Ken and Kjersti live and work in the Los Angeles, California area and enjoy collaborating on art projects and teaching their local youth Sunday School class together. 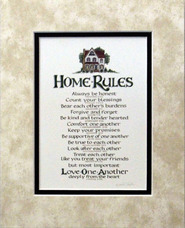 This is a beautiful of the Savior and adds such a special presence in the home. I can't tell you how grateful I am for this! My dad is very difficult to shop for (as I am sure most fathers are) and when he saw this sculpture he talked about how much he liked it. I immediately purchased it and it was a win win. 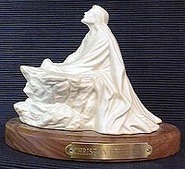 Beautiful sculpture and perfect gift! This year for Mother's Day, my children surprised me with this beautiful marble statue of Christ. They know how much He means to me. They also know how tough the last year has been and that only His love and strength have gotten me through. That is exactly what I see when I look at this sculpture. I love how tenderly He holds and shelters this little lamb and the complete trust the little one shows in Him. I also love the strength in Christ's posture and the elegant drapery of His robes. Needless to say, I burst into tears when I opened the package. Gorgeous! I highly recommend this item. We would like to share the sweet experience of having "Safe in His Arms" in our home. We are grateful for the constant reminder it is of the Savior and his great love for us. This beautiful gift has brought with it a calming peace that permeates every corner of our home. Friends and family who enter, are immediately aware of that sweet spirit and are drawn to it. The workmanship is without equal and it is simply a very gorgeous piece. We are indeed grateful for the blessing of having it in our home. I am so very touched by the beauty of this sculpture as well as the deep significance of the theme. (I would like the theme to be on the statue though). It reminds me that I can be safe in His arms and encourages me to provide safety and protection for others. I love that He has wrapped the lamb in His cloak. What a tender act of love. I feel very fortunate to have this inspiring piece of art in my home. Somehow it helps me feel the reality of the Savior Jesus Christ. I have a warm feeling of peace and hope each time I look at it.